I personally do not see a problem if an elected official gets sworn into office on a copy of the New Testament, the Tanakh, or a Koran. 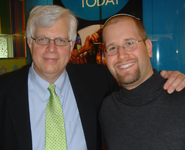 Dennis Prager (see photo at left from the 2005 Rabbinical Assembly Convention in Houston) obviously does. He's taken issue with Congressman Keith Ellison of Minnesota, who is a Muslim and the first to be elected to Congress, taking his oath of office on a Koran. My colleague and friend Rabbi Barry Leff weighs in at his blog, Neshamah.net.